Location cannot be beaten!! Literally walk out the front door and you’re in the main square, but the apartment faced the courtyard so you never heard the city noise. Team Irundo was very easy to deal with. The people working there were really nice and helpful. The bed was cozy. I also liked the balcony. Very clean apartment and in very center located. Stuff very friendly. The view was fantastic and the apartment was very comfortable. Awesome location. Staff super helpful, friendly & informative. Wonderful location walking distance to amazing sites. Old world charm with a huge balcony overlooking the city. Great location! It was only steps to restaurants and sights in the old town area. The tram stop was about a block away, it was easy to get to the train station, only 2 stops. Lock in a great price for Irundo Zagreb - Downtown Apartments – rated 8.7 by recent guests! Irundo Zagreb - Downtown Apartments This rating is a reflection of how the property compares to the industry standard when it comes to price, facilities and services available. It's based on a self-evaluation by the property. Use this rating to help choose your stay! 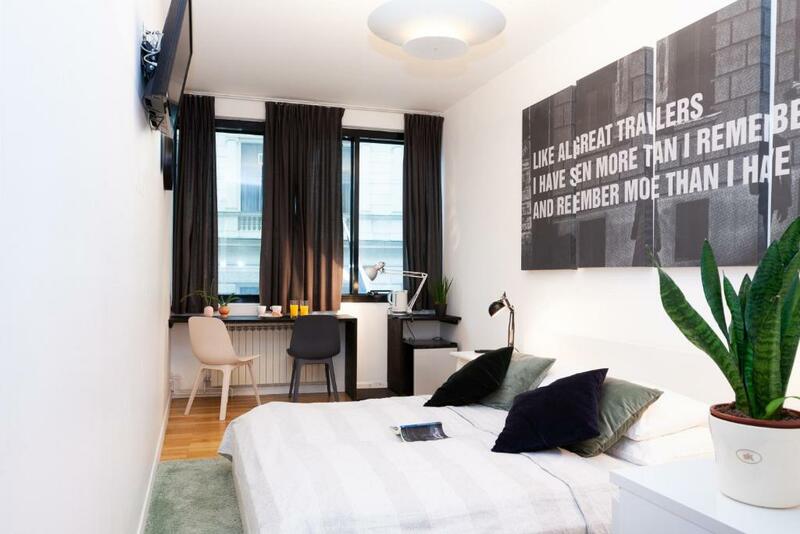 One of our top picks in Zagreb.Irundo Zagreb - Downtown Apartments is a collection of single units in various locations in the city center of Zagreb, about 350 feet from the Main Square. The property offers a modernly designed and air-conditioned apartments and rooms, with free WiFi access provided in each unit. Apartments include high-quality entertainment facilities and a seating area, as well as a fully-equipped kitchen with a dining area and a private bathroom. Within 10 minutes’ walk, guests can see the Modern Gallery, the Croatian National Theater, Croatian Academy of Sciences and Arts and Zagreb Cathedral. Zagreb Train Station is 1,500 feet away. 뀐 Located in the real heart of Zagreb, this property has an excellent location score of 9.4! When would you like to stay at Irundo Zagreb - Downtown Apartments? This 328 ft² large apartment is decorated with funky and modern furnishings and equipped with high-end entertainment facilities. The fully-equipped kitchen and living area are separated from the bedrooms. Apartment address: Nikole Jurišića Street 1a. Features a living room with kitchen facilities and a bathroom with shower. Modern and colorfully furnished apartment that features 2 bedrooms, living room with a fully equipped kitchen and a bathroom with shower. This apartment features 1 bedroom with a double bed, a living room with a sofabed, kitchen facilities and a bathroom with a shower. The apartment is on the 2nd floor. Please note that extra beds are not available in this apartment. This modern studio is in the very center of Zagreb, on the Main Square. On the 7th floor, it has a rooftop terrace that overlooks Zagreb's Old Town, the cathedral and the Dolac Market. It also features designer furniture, a cable LCD TV, free Wi-Fi and air conditioning. Modern and colorful apartment offering a spacious living room with a flat-screen TV, a fully equipped kitchen with a dining area and a bathroom with a shower. Large windows offer ample lighting. Located just few steps from Zagreb Cathedral, this modernly-designed apartmen features two bedrooms, two bathrooms, kitchen with a dining area and a living room with a big sofa and an LCD TV. A balcony with city views is also featured. Located just few steps from Zagreb Cathedral, this modernly-designed apartment features one bedroom with private bathroom, kitchen and living room with big sofa and an LCD TV. This apartment features a sofa, microwave and electric kettle. This studio features a balcony, satellite TV and electric kettle. This apartment has a kitchenware, private entrance and seating area. This studio features a electric kettle, kitchenware and balcony. This studio has a dining area, kitchen and microwave. This apartment features a sofa, satellite TV and kitchenware. This apartment has a microwave, electric kettle and private entrance. This apartment features a cable TV, washing machine and kitchenware. This apartment has air conditioning, private entrance and microwave. We are eager for new experiences, ready to immerse ourselves into a new city, ready to feel like strangers among new surroundings, ready to explore, to look around, to soak up the new world around us, and feel like we are part of it. When we immerse ourselves into a new world, it is exciting. We feel like real adventurers who don’t yet know what awaits them. We want to try something completely new, and experience the world of the unexpected, a world that we’ve never tasted, smelled, touched, seen or heard. A world that will enrich us internally and add new meaning to the everyday life of our expected world. Though this new, unexpected world is exciting, it is also strange to us. Amid the excitement and the newness, we need a place to feel secure, a protected shelter, a place that can even feel like home. Our need for home is a natural instinct. The quest of adventure is too often held back with our longing for the warm feeling of home. All adventurers want to both satisfy their natural instinct for home and the thrill of exploring new places. Be adventurous. Feel at home. Irundo team is represented by highly qualified and passionate young people. Quality service is our top priority. We will make sure that you enjoy your stay and will be at your disposal if you need any assistance during your stay. Also, our team can give some recommendations to our guests on what to do and see in the destination.